NPY, a candidate anabolic effector signalling molecule, stimulates energy intake. Prominent among anabolic effector pathways is a circuit containing neuropeptide Y (NPY). Injection of NPY into cerebral ventricles or directly into the hypothalamus of rats potently stimulates food intake and decreases energy expenditure while simultaneously inducing lipogenic enzymes in liver and white adipose tissue. Consequently, continuous or repeated central administration of NPY leads readily to obesity. Because NPY gene expression and secretion of the NPY peptide in the hypothalamus are increased during active depletion of body fat stores and /or reduced leptin/insulin signalling to the brain, NPY meets the criteria for an anabolic signalling molecule. Moreever, leptin inhibits arcuate nucleus NPY gene expression and genetic knockout of NPY reduces hyperphagia and obesity in ob/ob mice, indicating that the full response to leptin deficiency requires NPY signalling.The hyperphagic response to insulin-deficient diabetes is similarly accompanied by increased hypothalamic NPY synthesis and release, and this response is blocked by insulin administration, either systemically or directly into the brain. NPY is a member of the pancreatic polypeptide (PP) hormone family that includes also PP and Peptide YY (PYY). Several important physiological activities such as induction of food intake, inhibition of anxiety, increase in memory retention, presynaptic inhibition of neurotransmitter release, vasoconstriction and regulation of ethanol consumption have been attributed to NPY. Schwartz et al. Nature. 2000 Apr 6;404(6778):661-71. NPY-knockout can reduce obesity in leptin deficient mice. Two distinct Y-receptor subtypes Y1 and Y5 have been attributed to mediate the stimulatory effect of NPY on food intake. NPY, PYY, [Leu31, Pro34]-NPY and three N-terminally truncated analogs, NPY(2-36), NPY (3-36) and PYY (3-36) and PYY(3-36) have been shown to increase food intake. Recently, the first analog of neuropeptide Y (NPY), [Ala31, Aib32]-NPY has been developed with highly selective affinity for Y5-receptor (6 nM). In vivo adminstration of the [Ala31, Aib32]-NPY significantly stimulated feeding in rats. The relationship between stress and obesity remains elusive. In response to stress, some people lose weight, whereas others gain. Here we report that stress exaggerates diet-induced obesity through a peripheral mechanism in the abdominal white adipose tissue that is mediated by neuropeptide Y (NPY). Stressors such as exposure to cold or aggression lead to the release of NPY from sympathetic nerves, which in turn upregulates NPY and its Y2 receptors (NPY2R) in a glucocorticoid-dependent manner in the abdominal fat. This positive feedback response by NPY leads to the growth of abdominal fat. Release of NPY and activation of NPY2R stimulates fat angiogenesis, macrophage infiltration, and the proliferation and differentiation of new adipocytes, resulting in abdominal obesity and a metabolic syndrome-like condition. NPY, like stress, stimulates mouse and human fat growth, whereas pharmacological inhibition or fat-targeted knockdown of NPY2R is anti-angiogenic and anti-adipogenic, while reducing abdominal obesity and metabolic abnormalities. Thus, manipulations of NPY2R activity within fat tissue offer new ways to remodel fat and treat obesity and metabolic syndrome. Kuo et al. Nat Med. 2007 Jul;13(7):803-11. The first selective agonist for the neuropeptide Y Y5-receptor increases food intake in rats. The first Y(5) receptor-selective analog of neuropeptide Y (NPY), [Ala(31),Aib(32)]NPY, has been developed and biologically characterized. Using competition binding assays on cell lines that express different Y receptors, we determined the affinity of this analog to be 6 nm at the human Y(5) receptor, >500 nm at the Y(1) and Y(2) receptors, and >1000 nm at the Y(4) receptor. 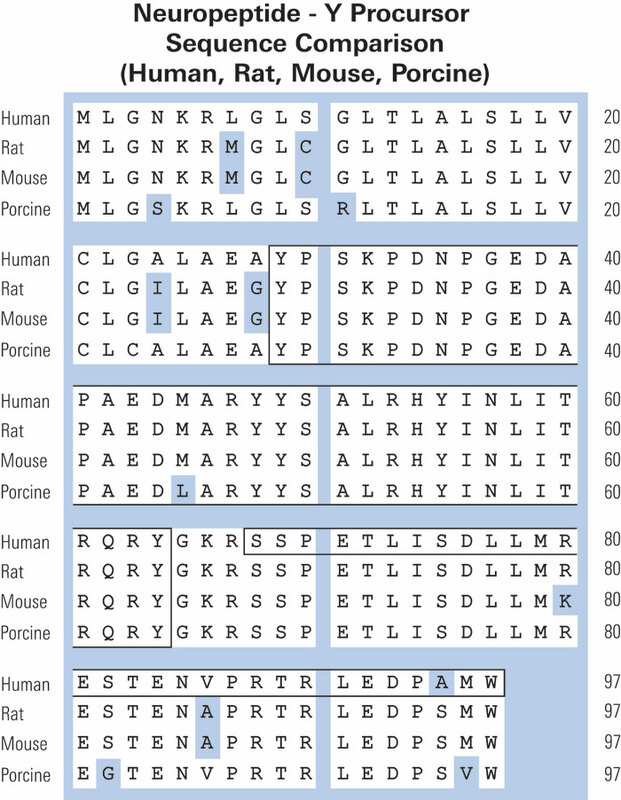 Activity studies performed in vitro using a cAMP enzyme immunoassay, and in vivo using food intake studies in rats, showed that the peptide acted as an agonist. Further peptides obtained by the combination of the Ala(31)-Aib(32) motif with chimeric peptides containing segments of NPY and pancreatic polypeptide displayed the same selectivity and even higher affinity (up to 0.2 nm) for the Y(5) receptor. In vivo administration of the new Y(5) receptor-selective agonists significantly stimulated feeding in rats. The NMR solution structures of NPY and [Ala(31),Aib(32)]NPY showed a different conformation in the C-terminal region, where the alpha-helix of NPY was substituted by a more flexible, 3(10)-helical turn structure. Cabrele et al. J Biol Chem. 2000 Nov 17;275(46):36043-8. 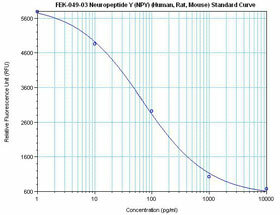 Immunoreactive neuropeptide Y (NPY) in plasma and platelets of rat and mouse strains and human volunteers. 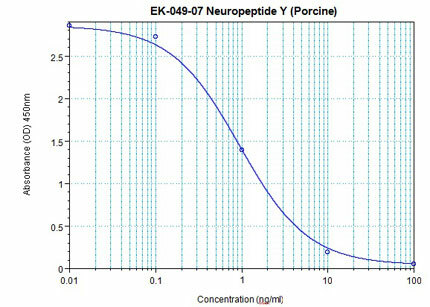 Immunoreactive-neuropeptide Y (i-NPY) is present in platelets of rats, and has recently been demonstrated to be authentic rat NPY based on its amino acid sequence. This potent vasoconstrictor and putative smooth muscle mitogen is released during platelet activation, suggesting a role in platelet-vascular interactions. We have now extended this work to several strains of rats and mice, and humans of both sexes. Among mice, strains in which NPY mRNA has been demonstrated in megakaryocytes have markedly higher levels of i-NPY (0.63-1.11 pmol/ml in NZB/B1NJ, NZBWF1/J, BXSB/MpJYaa, BALB/cJ) in platelet rich plasma (PRP) than other strains (DBA/2J, CBA/J, C3H/HeJ, MRL/MpJ-lpr, C57BL/6J; each < 0.02 pmol/ml). In rats, high content of i-NPY was observed in PRP and platelets of all strains examined (Sprague-Dawley, Wistar, Wistar Kyoto). 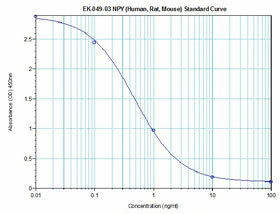 i-NPY level was 30.6, 3.7 and 10.1 pmol/ml in PRP of the three strains, respectively. In humans, low levels of i-NPY occur in plasma and platelet fractions compared to rodents (0.069 and 0.048 pmol/ml in male and female PRP, respectively), but they, too, have greater i-NPY in platelet rich plasma and platelets than in platelet poor plasma. Assuming this is authentic NPY, platelet-derived NPY might have a role in pathophysiological states involving activation of platelets in humans. Myers et al. Regul Pept. 1993 Sep 22;47(3):239-45. Stress, in the presence of an HFS diet, causes the upregulation of plasma NPY and fat Npy, Npy2r and Dpp4 expression, increasing visceral fat growth. (a) Levels of NPY-IR in platelet-poor plasma (PPP) and platelet-rich plasma (PRP) from 129X1/SvJ mice under conditions of a HFS diet, cold, cold + an HFS diet, and aggressor (Aggr) + an HFS diet compared to non-stressed standard chow-fed control (CTL). (b) Changes in visceral fat measured by 3D-MRI volume reconstruction imaging of fat in mice on HFS diet, cold + HFS, and Aggr + HFS, compared to non-stressed mice on standard chow diet (CTR). (d) Npy, Dpp4 and Npy2r mRNA levels in subcutaneous abdominal fat of HFS and cold stress treated mice as compared to untreated control mice (quantitative real-time PCR). (e,f) Immunohistochemistry of Npy (e) and Npy2r (f) localized to vessels and adipocytes in subcutaneous abdominal fat in mice. Scale bars, 20 mm. The results represent average values ± s.e.m. of n ¼ 6 mice. *P < 0.05, **P < 0.01 by one-way ANOVA with Bonferroni’s multiple t-test. ND, not detected. There is little information on how neuropeptide Y (NPY) proteolysis by peptidases occurs in serum, in part because reliable techniques are lacking to distinguish different NPY immunoreactive forms and also because the factors affecting the expression of these enzymes have been poorly studied. In the present study, LC-MS/MS was used to identify and quantify NPY fragments resulting from peptidolytic cleavage of NPY1-36 upon incubation with human serum. 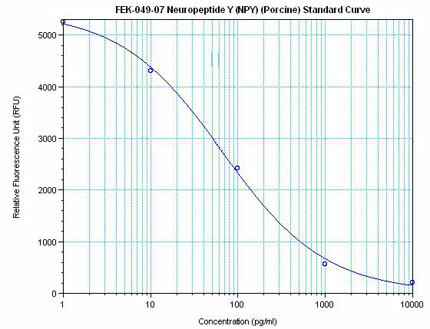 Kinetic studies indicated that NPY1-36 is rapidly cleaved in serum into 3 main fragments with the following order of efficacy: NPY3-36 >> NPY3-35 > NPY2-36. Trace amounts of additional NPY forms were identified by accurate mass spectrometry. Specific inhibitors of dipeptidyl peptidase IV, kallikrein and aminopeptidase P prevented the production of NPY3-36, NPY3-35 and NPY2-36, respectively. 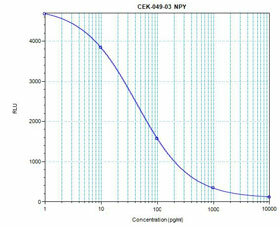 Plasma kallikrein at physiological concentration converted NPY3-36 into NPY3-35. Receptor binding assays revealed that NPY3-35 is unable to bind to NPY Y1, Y2 and Y5 receptors, thus NPY3-35 may represents the major metabolic clearance product of the Y2/Y5 agonist, NPY3-36. Abid et al. JBC Papers in Press. 2009. Proposed kinetic model of NPY (1-36) cleavages into truncated forms. NPY(1-36) is predominantly cleaved into NPY(3-36) by DPPIV, and through a slower process by AmP into NPY(2-36), resulting for both peptides in a lost of affinity for NPY Y1 receptors. A fraction of NPY(3-36) is further degraded by plasma kallikrein into NPY(3-35). which do not retain the ability to bind to any NPY receptors. Unknown proteases are likely to be involved in the degradation of NPY(1-36), NPY(2-36) and NPY(3-35) to yield shorter forms, found in trace amounts. Pinto et al. Science. 2004 Apr 2;304(5667):110-5.